CircusWest presents its newest theatrical circus creation inspired by the famous children’s book by Roald Dahl. James and the Giant CIRCUS Peach is a story of a young boy who befriends a colony of eccentric giant bugs who live inside a gigantic peach, and chronicles their travels around the world. The show is filled with surreal challenges as James and his newfound friends embark on a circus journey to escape his troubled past and build a bright new future. Along the way, James witnesses daring acrobatics, stunning aerials, mesmerizing object manipulation, and feats of balance that astound and amaze. 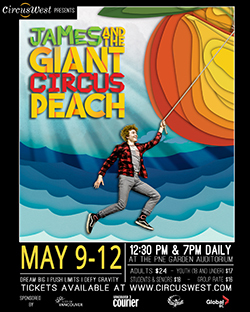 Join James and CircusWest as they present James and the Giant CIRCUS Peach at the PNE Garden Auditorium May 9-12 2019 with two shows daily at 12:30 and 7pm. Groups 10 or more $16, Youth $17, Students and Seniors $18, and Adults $24 (plus applicable service charges). – Limited wheelchair seating available. Please email info@circuswest.com to reserve your spot. – For ages 4 and up. Not appropriate for babies or toddlers. – Show length is approximately 90 minutes plus a 20 minute intermission. Please note there is no intermission on the Thursday and Friday matinees. – Doors open 40 minutes before the start of the show. General Admission seating. – No food or drinks are allowed in the auditorium. – No flash photography or filming of the performance allowed. – Please note there are 2 sets of stairs to reach the seating area. – Tickets on sale at the door for each performance based on availability.